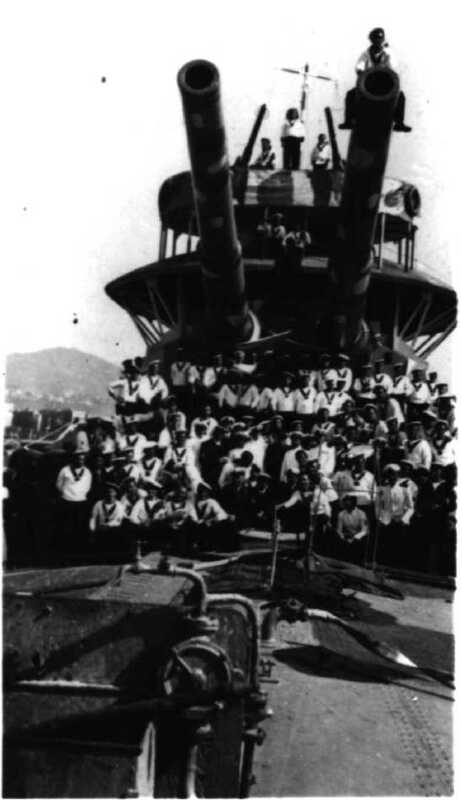 381 mm/40 (15") guns on Italian monitor Faà di Bruno. Photograph courtesy of Eugenio Vajna, whose grandfather was her last captain. These weapons were intended for the Francesco Caracciolo class battleships. Construction of these ships was suspended in 1916 and the guns were then used on monitors, floating batteries (pontoons), railway guns and coastal fortifications. 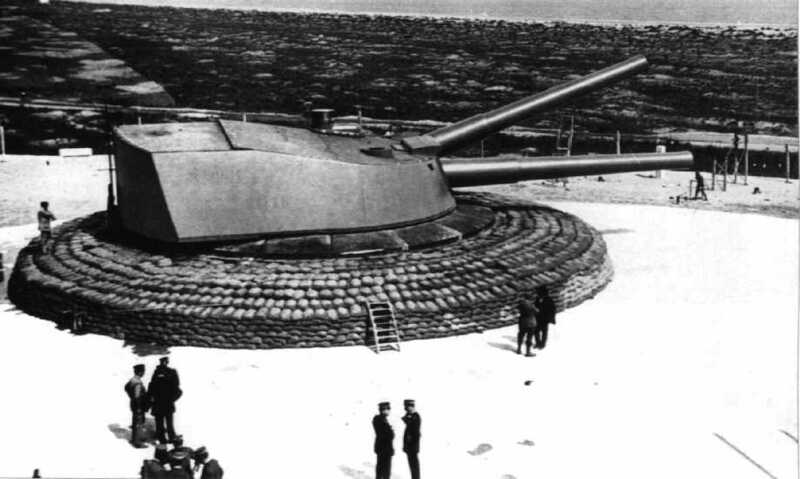 During World War II the monitor Faà di Bruno (redesignated as GM 194) still carried these weapons and there were a total of ten guns mounted in Italian coastal defenses as of June 1940. During modernization programs prior to World War II, the coastal fortifications at Genoa and Augusta had their turrets modified for increased elevation. In 1913 three companies were each given an order for twn guns: Elswick Pattern "A" (Pozzuoli), Vickers Mark "A" (Terni) and Schneider-Ansaldo. The first two companies built wire-wound guns but the Schneider-Ansaldo guns were of monobloc construction and considerably lighter. Actual production was the proof gun and nine production guns from Schneider-Ansaldo, about twelve from Elswick and three from Vickers. 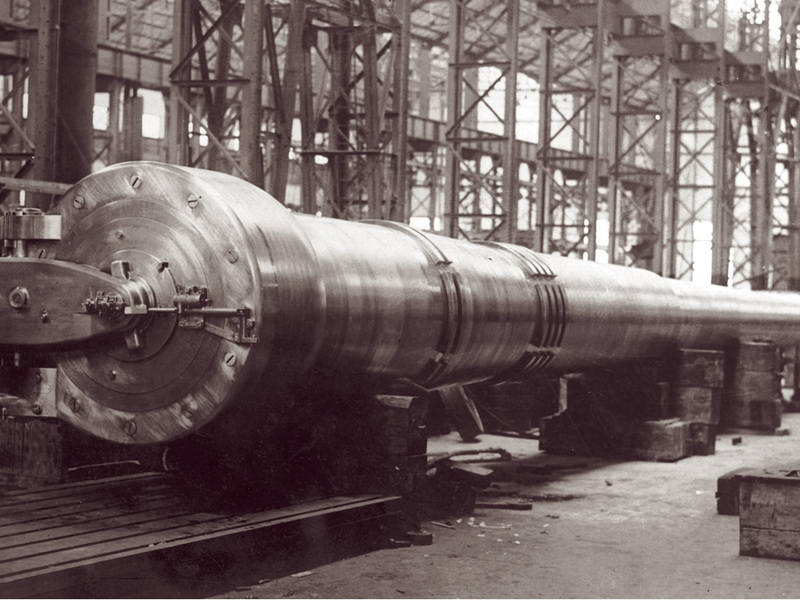 Unlike many other European 38 cm guns, the bore of this gun was actually 381 mm (15.0"). Actual bore length may have been 40.9 calibers. ^The turret on Faà di Bruno was modified to allow +30 degrees elevation. Pontoons had a single open mounting with +35 degrees maximum elevation and +/- 15 degrees of train. The coastal fortifications at Genoa and Augusta were modified to allow +30 degrees elevation. Battery Amalfi/S.Panagia. Ufficio Storico Marina Militare (USMM) Photograph. 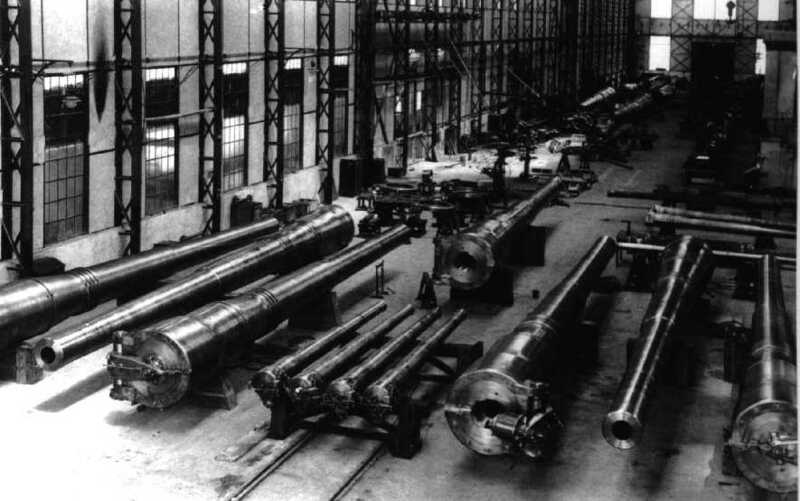 381 mm/40 (15") guns under construction at the Ansaldo Works. The heavy box is apparently a counter weight. Photograph courtesy of Eugenio Vajna. 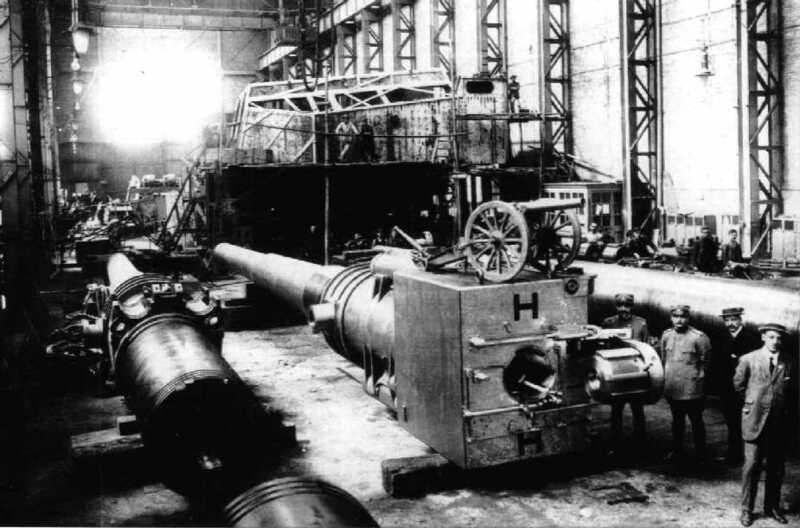 381 mm/40 (15") and smaller guns under construction at the Schneider-Ansaldo Works. Note that the 381 mm guns were built in both right and left versions. Photograph courtesy of Eugenio Vajna. 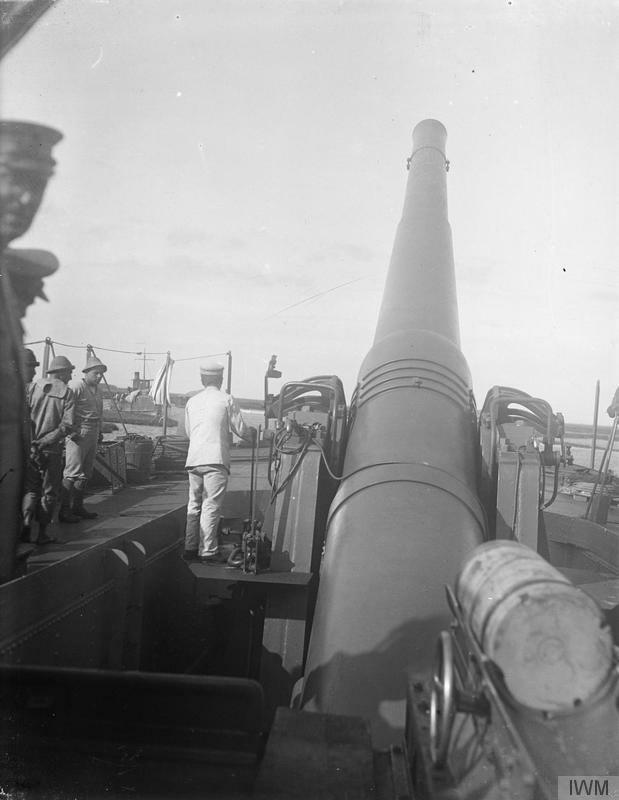 381 mm/40 (15") gun. Photograph copyrighted by OTO-Melara. 381 mm/40 gun being used on a pontoon during World War I. IWM photograph Q 19099.